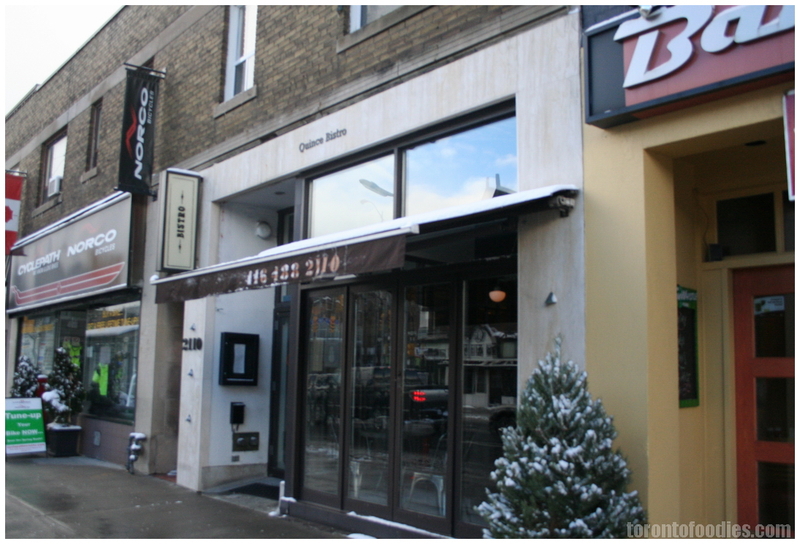 I’ve worked in the Yonge/Eglinton area for the past 3 years now, and passed by Quince Bistro countless times. Spying on the patio patrons during the summer, the food didn’t particularly stand out, and there were never line-ups at the door. It wasn’t until the past few months that I’ve finally eaten there twice, and had a wonderful experience each time. There isn’t a distinct style of cuisine, but the food is honest, clean- and well-executed, and focuses on a few fresh simple ingredients per dish. Both times I’ve ordered their in-house made pasta, and have come away impressed. My lunchmates were similarly pleased by their dishes. Best of all, on all my visits, the menu has been different, taking into account seasonally appropriate dishes and keeping things fresh. I generally avoid Winterlicious & Summerlicious menus, wary of drops in service and food quality, due to the shear increased volume. Additionally, ‘Licious menus often aren’t representative of regular menu dishes, which bothers me as well. Despite my reservations, I was very enticed by Quince Bistro’s $15 lunch, which is exceedingly reasonably priced. 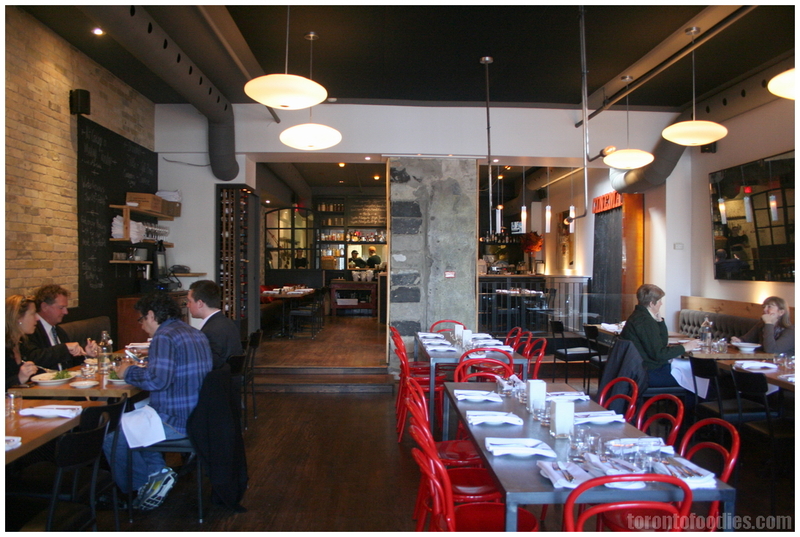 The bistro glows bright and refreshing from the natural lighting of the glass front windows. The venue is spacious, and the kitchen is visible through a waist-high window, adding to the depth of the room. There’s additional space downstairs for special events. Jennifer, one of the owners, came around to check how we were doing. 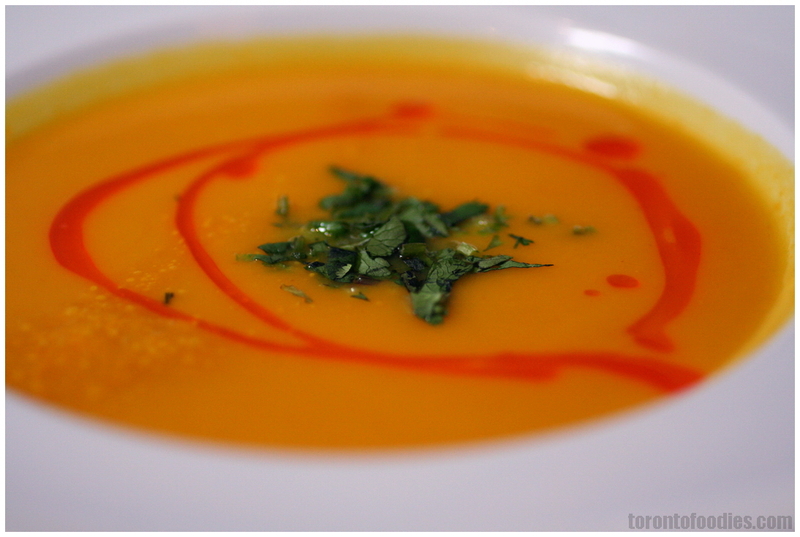 The butternut squash soup with chili oil and coriander was spot on, with tomatos providing an acidity backbone. The chili oil tingles ever so slightly, but the coriander brightens up every spoonful. I think a dusting of crouton crumbs would have been a great texture contrast without taking away from the flavour. 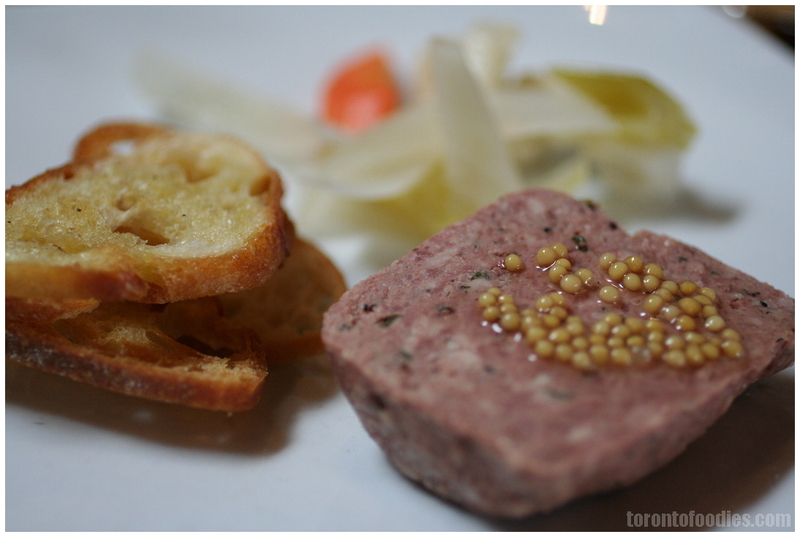 The country-style pate with house pickles, toasts, and pickled mustard seeds. I was extremely impressed with the pate – it didn’t taste heavily of pork or liver, and had a bit of sweetness and wine to it. It reminded me of a Taiwanese sausage or Filipino longganisa, but served cold. The sweetness and mild meatiness contrasted wonderfully with the sweet & tart pickled cauliflower, carrots, and onions. The cauliflower had great fresh crispness, and the onions were still firm but mellow. The toast, though thin, had enough crunch to stand up to the density of the pate. The Orchetti et Funghi, flat disks of pasta, tossed with mushrooms, brussel sprouts, in a black truffle and porcini oil, topped with shredded Grana Padano cheese. 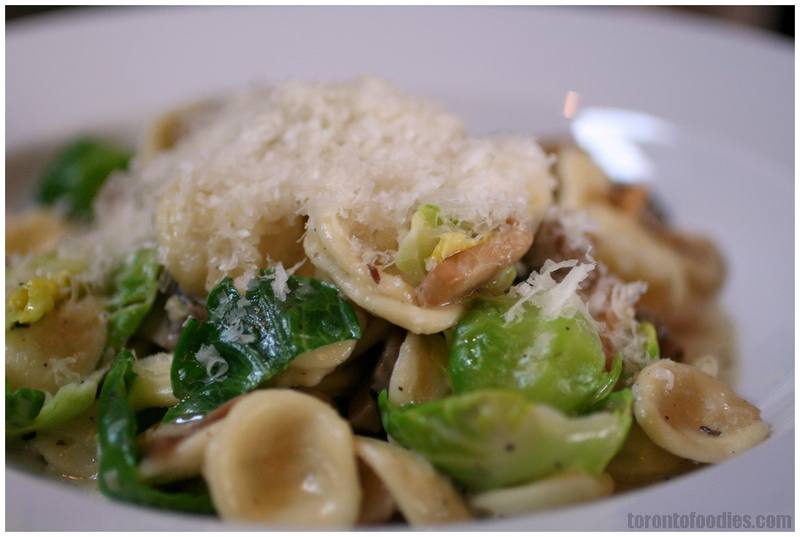 As always, their pastas are cooked perfectly, with just enough tooth to give some resistance. The brussel sprouts, lightly cooked (blanched?) have just enough flavour to be paired up with the very earthy mushroom sauce, without stealing the show. The Grana Padano adds a hint of acidity, again, very well balanced with the rest of the ingredients. The truffle oil pasta dish that I ordered on a previous visit to Quince had a lot more truffle essence and earthiness, compared to this dish. I think that did leave me slightly disappointed, but the pricepoint absolutely cannot be beat, so I see the economic limitations. 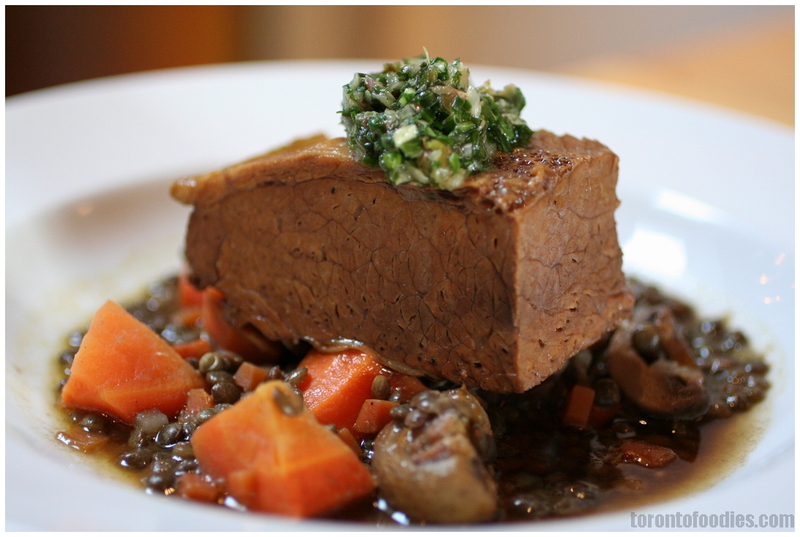 Braised beef brisket, on du Puy lentins, with mushrooms & carrots, topped with salsa verde. The kitchen has transformed a lean hunk of beef brisket to fork-tearble tenderness. While tender, the brisket could have benefited from braising in a stronger broth/marinade, as it didn’t really carry enough saltiness or other flavour. The salsa verda, a tart blend of parsley, green onions, did help to brighten up the dish a little, but still falls short. The lentins had a great just-tender consistency, as did the carrots and mushrooms. While the flavours were all completely in balance, the entire dish was missing a bit of “oomph”. Checking their ‘Licious menu after the fact, I don’t recall tasting any smoked bacon during my meal (as described on the menu), but I don’t think that was critical to the dish. 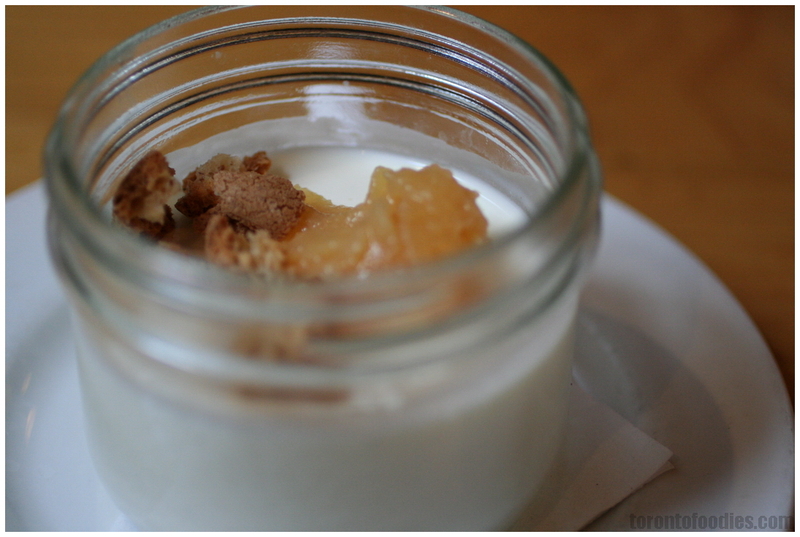 For dessert, the Vanilla Panna Cotta, served in a mason jar, topped with quince compote and amaretto crunch was the favourite. The firm dense cream, slightly tart (using yogurt? ), was not at all heavy. The quince compote reminded me of buttery apple pie filling, and the crumbles of amaretto biscuits lent its sweetness to the otherwise mildly tart cream. Texture-wise, it was very similar to a Greek yogurt in density, but far silkier. A trio of cookies weren’t particularly memorable. 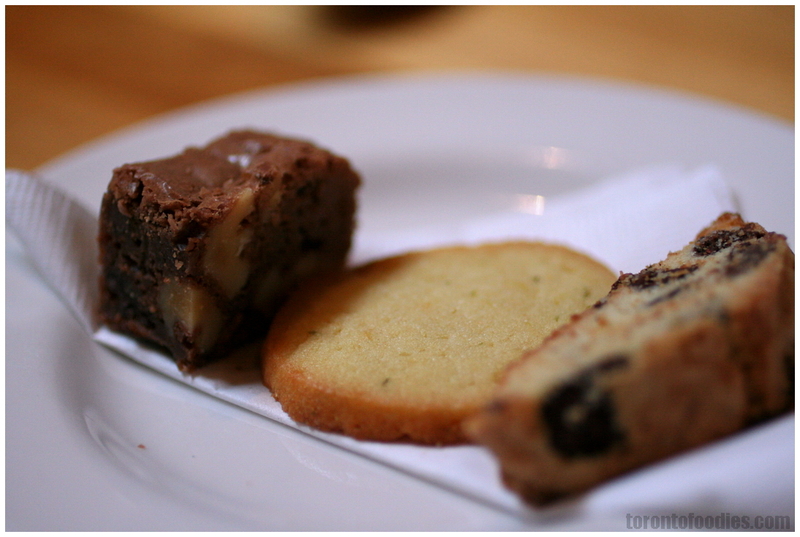 Two bars of biscotti and a lemon almond cookie could have benefitted from a pairing of coffee, but we were far too stuff at that point to consider it. As a $15 lunch, this meal was an absolute steal, as many of the items were close to their regular menu quality. Their dinner menu offers some additional selections, and is still reasonable at $25. Would definitely recommend Quince Bistro for regular menu meals, but their Winterlicious lunch comes just short of being a “can’t-miss” recommendation for Winterlicious (but definitely worth going for its price).